Lunch out, and surprise visit. Mas and I are feeling better today. Ben called round this morning to say that as there is an atrocious weather forecast for Saturday they have decided to postpone their BBQ. Mas and I drove off to Stanmore to get shopping, mostly cat food, and then had lunch in the Man in the Moon. We drove home, unloaded the car, and Mas went off to get more from Burnt Oak. Monika phoned, and said that they were close by, and could they visit. It was really nice to see Monika and Oktay, and Milan and baby Talu. Monika had done well with her exams recently, which is an achievement with two little children. Milan conversationally told me he can speak three languages, which is true; Czech, Turkish and English, and he has not started primary school yet. They have recently come back from Turkey and will soon go on holiday to Czech for a few weeks. I wish Mas and I could find out where the children get all their energy from so we could get some too! When we went to bed salty hid behind the bathroom door, and when I looked later he was waiting at the top of the stairs. Before I had gone to sleep I heard the other cat come up the stairs, and they both ran out of the house. I am not quite sure whether the tabby cat is stalking Salty, or whether they are friends. On Monday I spoke to Pete, and phoned Robert. Mas and I did our usual things, watched a 'Monk' in the afternoon for a break, and a 'Wallender' during the evening. On Tuesday I walked down to Edgware to drop off a request for a prescription for Mas, and then persuaded the dispenser at Boots to give me some of the pills in advance for Mas. I got some shopping, and came back on the bus. Later Mas went to the doctors as his prescription was ready, and was surprised to see Heather, who we met at Marion's party, is now working as a receptionist there. On Wednesday I walked to Edgware again, and got a refund in the prescription, and got some shopping. The surveyor from the glass company was supposed to come round and measure up for our broken conservatory roof panel, but he did not come! We watched a Pie in the Sky in the evening, and had a candlelit dinner, listening to one of Toby's relaxing jazz CDs, and relaxed. We seem to be feeling better now. We drove back to their house and then Mas and I dragged ourselves away and drove home feeling rather tired. We unloaded all the fruit and vegetables. Poppy called in to see whether we had the Swine flu, because she would give us medication if needed, but after answering a few questions it was clear we have a different bug. We talked for a while, and as Poppy left she said if we did not want Salty she would have him. During the night Salty jumped onto the bed, bringing his hedgehogs with him, and lay on my feet. I eased him off as he is quite heavy now, and he spent the night sleeping on the bed instead of playing outside in the garden. I think he must have understood what Poppy said! Mas spent most of the day on his computer, and I washed all the dusty curtains in the conservatory, re potted a houseplant, and began to make some cushion covers for the dining room. I spoke to Alex about his recent tests, and it seems that he is alright, but has to wait for the following appointment to be told officially that all is well. I had an email from Diane who is on holiday soon. 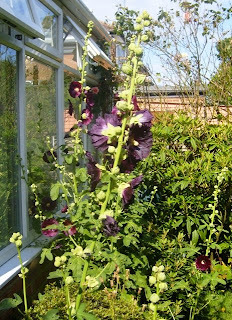 We have lots of these hollyhocks in the garden which range from maroon to almost black. I don't like them, and am planning to put in some more cheerful colours with them next year. During the night I spent a lot of time coughing, and at one point was disturbed by a cat galloping about in my attic studio. I went up to see if it was the dark cat, and it was. He is a pretty tabby with white paws and a white nose. He looked at me confrontationally, so I went downstairs to see if he had eaten all the cat food, but he ran past me and pushed open the door and escaped. No sign of Salty, but the food was all gone! Today my cough seemed a bit better, although Mas is still coughing a lot. I managed to fix the jammed CD drawer on my computer, and finished the cushion covers I was making, during a thunderstorm. We watched NCIS, and then I began sorting out my music CDs that Toby had given me, and played with the cat. He prefers classical music, especially violin solos. Yesterday both of us were still under the weather, but Mas took the car down to the garage for a further checking over. In the afternoon we watched an old movie, Bob Hope in Son of Paleface. It was nice to see him again, but I seem to remember that it was much funnier than I thought it now. Of course Paleface was the funniest one. We went to bed at a reasonable hour as the insulation people are expected at 8.00am tomorrow. Today we got up and managed to have our coffee and breakfast before they arrived. Once with us they efficiently and thoroughly did their work, but accidentally broke one of the large panels in the conservatory roof. This will be dealt with by the company in due course. It was a noisy business having all the drilling done, and took about three hours. Salty was showing the whites of his eyes. Later I found I had a nice email from Betty, and we watched a new Midsomer Murders with John Nettles, then tottered off to bed feeling exhausted. At this time I think I could cough for the Olympics. Lying awake between bouts of coughing I heard the cat come up the stairs, then I thought it strange as it was not making the usual meeping noises. I jumped out of bed and saw a dark cat on the landing, both of us jumped, then the cat shot off downstairs and left the house, all I could see were white paws moving at speed. I have seen Salty hanging around with a tabby with a white nose and wondered if it was the same cat. Dodgy health and watchable TV! Yesterday I woke feeling much better, and so Mas and I did some gardening and I cleaned and tidied a kitchen cupboard. For the rest of the day I did some reading and felt tired, and in the evening we watched Heartbeat. Today we went to Borehamwood and got some more Frontline spot on for the cat and some shopping. Once home again Salty was leaping about in the conservatory recklessly, and I saw he was after a lovely Damsel fly, with a bright blue dot on it's tail, which had flown to the top of a window. I managed to get the damsel fly to walk onto my hand, at which point Salty burst out purring thinking I had caught it for him! Luckily the fly flew off into the garden and escaped. Mas is beginning to get a sore throat, and I am at the coughing stage now. We watched another insane episode of the X Files, and after diner saw 'Wallender' which is an excellent Swedish series about a logical detective with interesting story lines. Yesterday the cavity wall insulation men came to do our walls, but had not been told we had a conservatory and had not got the right ladders; they will return next week. The cat has a ding beside his eye, it was lucky he did not get an eye injury. Toby called briefly to say he was home despite further long delays on the journey. I also spoke to Pete and Diane. My brother Alex called too. Today Margaret phoned, and I had to tell her I did not feel well, thinking possibly this is a mild version of Swine Flu, whatever it's name is I think it is a swine, and will be happy when I stop feeling so listless and dreary. Mason finished off the curtain fitment in the bedroom, and filled all the holes with plaster. When I feel more enthusiastic I will make a pelmet to disguise the curtain rod. I made a list of important things I need to do urgently, and went to bed instead. Seeing Toby off and rotating books. We had breakfast, before Mas drove Toby to the Two Jays where he got a few books. We had lunch, then We drove Toby off to Mill Hill where he got the train to stay with Pete; it was very sad to see him go. Toby was not feeling well, and by this time I had a sore throat too. Clearing Toby's bedroom later I saw a beautiful big green cricket or grasshopper on the wall, then caught him and put him outside. There was a time when if Toby had seen him first he would have been history. Toby also took a couple of my books down to Pete's, but mysteriously others have appeared on the shelf. One is called 'Bad Thoughts a guide to clear thinking', by Jamie Whyte which I thought may help me, but it is funny and interesting. Today Toby is flying home to Romy, and called to have a last chat. As it happened when he got to the airport there was an almost 4 hour delay, how maddening. I did a little gardening, and talked to Barry over the fence for a long time. I went in and made a fish pie for dinner, and also cooked some for the cat. This weird sore throat seems to come and go, so for part of the day I feel normal, but for the rest of the time I feel rather exhausted. Luckily Mas is feeling fine, and Salty was very pleased about the fish. At one point there was a massive thunderclap, but it passed and we watched The Mentalist in the evening. Yesterday I spent a lot of time cutting up and freezing mint and parsley, then doing some housework until Toby returned around 4.00pm. The weather was bright and cheerful, and Toby showed me a newspaper with an article about Sark; the Barclay Brothers have not managed to elbow their way into controlling local affairs there, which pleased me. Toby and Mas managed to get in some more Battlestar Gallacticas, and I had some time to start reading Pete's Skelly book. We had an early dinner, and Toby went off in the evening for a last visit with his friends, Mas and I relaxed. Today Mas and Toby watched more Battlestar Gallacticas, Toby feeling rather tired. Later Toby and I walked down to the Two Jays to make a list of books that Romy may not have read. In the evening Toby went out for a meal with Gerald and Gillian, but was feeling a bit poorly, and Mas and I decided we could not be bothered to cook, so went to the Man in the Moon for dinner and when Toby returned we spent more time talking before bedtime. Epic poems and night strategems. Mas and I had a day catching up with gardening, doing lawns and hedges, and the weeding. Diane phoned and chatted for a while, she has a bug and is not feeling well. In the evening I left Mas to another evening of mayhem and violence, and listened to a play on the radio. It was an adaption, by Michael Symmons, of Tennyson's epic poems about King Arthur called 'Idylls of the King' which was a riveting two hour performance; it was wonderful to listen to something where the language was so beautiful. Today Mas and I set off for St. Albans and met Tania and Robert at the Bua Thai restaurant and had lunch. Mas and Robert got talking so much, that Tania suggested they go for a coffee together, and we went to look at the French Market which was there today. We did not see anything unusual, and the prices seemed very high. In the evening I cut my hair, and we watched an NCIS, and I played with Salty as he had been in most of the day and it was raining all evening. During the night, when he is usually out, it was raining, so he kept trying to make me play all night, and even bought the hedgehogs up and put them on the bed, plaintively miaowing, and also a small teddy bear. Getting little response, he would occasionally pounce on me wrestling and biting in brief but bitter forays. Today Toby went off quite early to go to see Danny in Wales. Later I went round to John and Margaret's as I had been invited to walk with them, and the dog Henry. We set off first to feed their daughters family pets, two nice guinea pigs. The house was a beautiful 1930s Art Deco house, and had been carefully kept that way. That done, we set off to some woods I had never been to before, somewhere between Aldenham and Radlett. We parked near the John the Baptist Church in a traditional village green, with an old farm that has been converted, and some farm cottages. This church has been in continuous use for 750 years. Sadly my camera batteries were down. We walked through woods that surrounded a golf course. Some of the trees that had needed to be cut down were taken down leaving tall stumps which had been carved into different animals and birds. John pointed out a mulberry tree with green fruit on it, something I had not seen before. There were lots of hazelnuts and sweet chestnuts too, but I am sure when they are ripe the squirrels will take them first. John did say he would collect me for blackberrying later. While we were talking and walking John was collecting golf balls from hedges and thickets, I believe he found about 7, and he later gave them to some golfers, some of the balls were marked, and we left them trying to work out who they belonged to. When we came home Margaret and John persuaded me to have a cup of tea and biscuits in the garden. They have recently had cavity wall insulation done, and they gave me the name of the firm that would do this. In the evening Mas and I watched The X Files, The Bill and the Mentalist, and I almost had to be carried up to bed after this. Today, after a leisurely breakfast, Toby and I went to Hampstead to meet up with Diane. She called us, and we met walking towards each other. We decided to go to Burgh House for a light lunch before going on to The National Gallery. 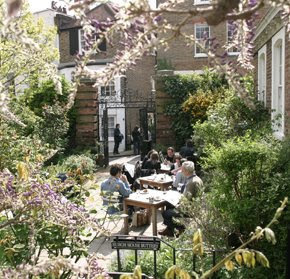 Burgh House has a museum and a gallery, and hosts various interesting events and has a nice cafe. 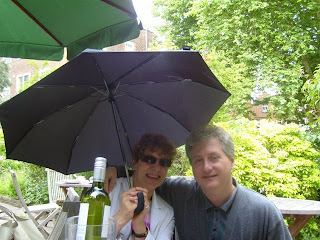 We ate in the garden, and had some white wine too, but it began to rain so we were sitting under table umbrellas. 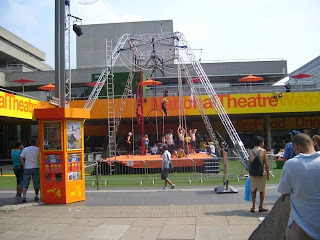 After lunch we took the tube down to Leicester Square, and walked to Trafalgar Square. There was a crowd on one corner because a plinth had been erected, (Anthony Gormley's idea) so that different people could perform for an hour each. We went in to look at the exhibition 'Corot to Monet', it was very crowded. I really liked one small landscape of a late afternoon sky, with a dark foreground. I am convinced that if this painting was put into a dim room the glowing sky would provide as much light as a 60 watt bulb. Sadly I can't remember the artist's name. Diane began to feel very tired, so left us to it. We looked for a while longer, then thought we would walk around Soho and Covent Garden for a while. 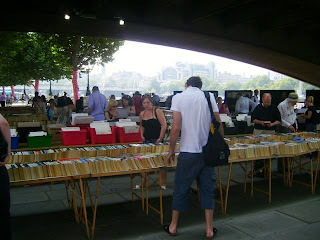 Once outside it began to rain again, so we looked in some of the bookshops in Charring Cross Road before going home. Luckily the train beat the rain, and we made it home before the rains came. After a nice dinner Toby and Mas fed their addiction again. 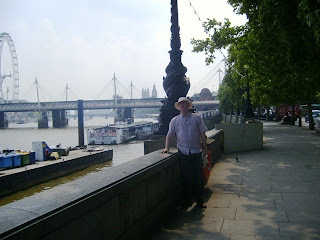 Today Toby and I went off to Pimlico and walked to the Tate Britain. We looked at some of the modern art, but made a beeline for the Turners and Blakes and looked at those and other interesting landscapes. We had a drink and snack in the gallery before looking at more of the modern art. When we left we intended to walk around town for a while, but did not get far before the rain started and we had to shelter in a pub (poor things!) Eventually we made it home without too much of a soaking. Toby and Mas are Battlestar Gallactica addicts, and spend all free moments watching these like rabbits paralysed by car headlights; I do not mind, so long as I don't have to watch too. Toby, Mas and I went down to Edgware and did a few chores. After a quick coffee, Mas went home to work, and Toby and I went to the Victoria and Albert Museum. 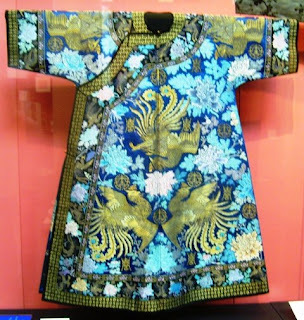 We looked at sections showing Indian, Chinese, Japanese and Korean artifacts and all were stunning. I loved some of the miniature, intricately, carved boxes that were carried on sashes as the clothes had no pockets for wallets or purses in the traditional Japanese costume. I was surprised at how beautiful the Korean written language is, and the simplicity of some of their ceramics. It was also interesting to find out that when tobacco reached Japan they knew it was bad for people, but people smoked anyway, but with very long pipes which would only hold enough tobacco for only one or two puffs. 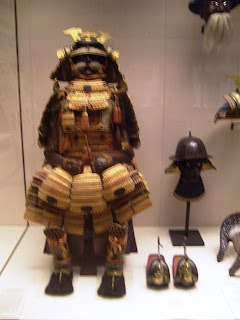 Japanese armour, rather a blurry picture though. After a while Toby and I went out into the courtyard and had a snack which was delicious. The weather was still very humid with odd heavy showers between the sunny periods. When we left the museum we walked past Harrods to Hyde Park to take the tube. There seemed to be delays with trains stuck in the tunnels, so we decided to go home on the Jubilee line to Stanmore. Later I heard that there had been flash flooding and several of the tube stations were closed, including Hyde Park. We all had dinner at home, then Toby went to Hampstead to meet a friend. Diane phoned and chatted, then Mas and I relaxed watching TV. Yesterday Pete arrived around lunchtime, and we all spent most of the day talking, eating and drinking which was fun. 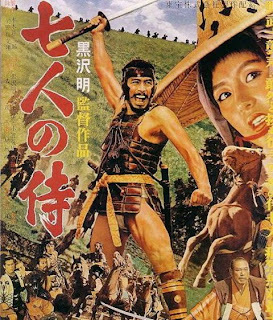 Later we decided to watch Akira Kurosawa's Seven Samurai which we were all enjoying, but we had to stop it and go to bed as we were all really tired. Today we all had breakfast together and watched the end of The Seven Samurai. We all enjoyed it, and I thought the development of all the characters was very interesting; each having a well developed personality. We had lunch together then around 3.00pm Pete left with Toby, Pete home to Brighton and Toby going to town. This morning Toby and I took the tube to Euston and we walked to Bloomsbury, looking at his old haunts when he was a student here. We stopped at an interesting Italian cafe and had a sandwhich, before wandering into St.Georges church. This church was the last one that Nicholas Hawksmore designed. It is an 'auditory' church, and while we were looking around there was a musical rehearsal taking place out of sight. The church was consecrated in 1730 by the Bishop of London. Susequently there were many alterations made to the church including a drastic reorientation, and the purity of the design was lost. Recently the church had been restored to the original design. There were approximately 900 people buried under the church in the Undercroft, they were carefully disinterred and reburied elsewhere. 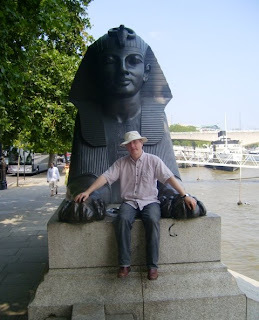 This area is presently being used as a museum.When we came out, Toby went to the British Museum briefly, and I hurried home to help Mas. We were expecting Tania and Robert (who had recently had a birthday), and Poppy and Ben who have recently returned from Guernsey for dinner, together with Toby. I scurried around tidying things and setting the table before our guests arrived, and Mas put the finishing touches to the food. Tania and Robert bought some champagne, and Mas made a really nice dinner, and everyone was busy chatting at the table. Poppy, talking to Tania and me began to recount a very spooky real happening that she and a colleague had experienced at work, and when she told us how the customer had disappeared into thin air, Tania let out a shriek, and said "Oh no", which seemed very funny at the time, and got everyones' attention. This was a very nice evening. Yesterday Mas had to meet a friend at lunchtime, so Toby and I went on a walkabout in Edgware, spending time looking at the books at the Two Jays bookshop. Toby began to try to sort out my computer, and later Mas made a really nice dinner before Toby went out to meet his pals (aka The Rabbits). Mas and I relaxed at home. 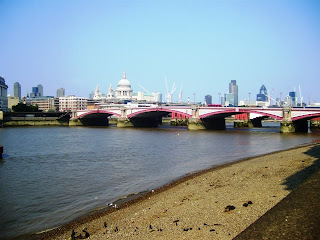 Today, after breakfast Toby and I took the train down to Embankment, and walked along, then over the Thames, to the South Bank. 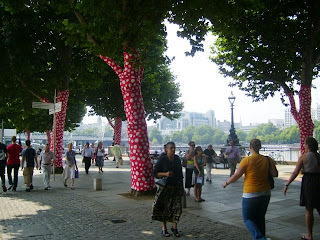 The weather was terribly hot, so it was nice walking under these spotty trees, and then to the coolest place in London, under the bridge, looking at second hand books with a breeze coming off the Thames. 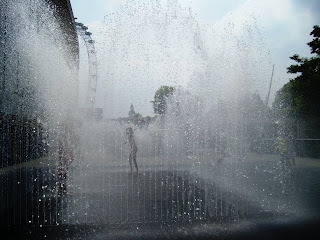 Children were bathing in the fountain, and some fully clothed adults too! We had lunch at Gabriel's Wharf, and I can't remember when water last tasted so good. 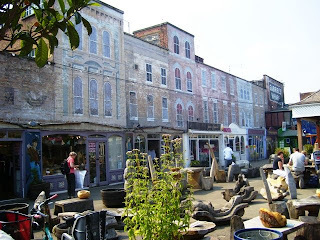 The windows above the shops are all tromp l'oeil; painted on, but not real. We went into the Tate Modern and looked at some of the art. We walked into one room where there appeared to be tables strewn with junk, including old tyres; like the inside of an untidy shed or garage. What was surprising was that these very life like things had all been carefully made out of polystyrene (styrofoam), and painted. It took them 8 years to complete, I privately wondered why they would bother to make them, but I guess it was because they could! 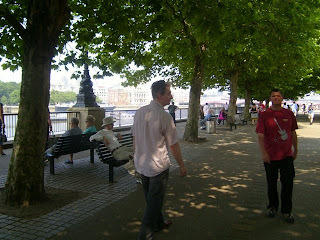 Before we left we had a coffee in their cafe, then walked across the Thames and wended our way home again.